The Energy Industries Council (EIC) has announced the winner of its first EIC Rising Star MBA Award, a new initiative developed in partnership with RGU to help develop the leaders of tomorrow in the oil and gas sector. Daniel Gear of Petrofac, who will study for his MBA Oil and Gas Management on an Executive Part-Time basis at Garthdee campus is the first recipient of the Rising Star Award and will receive full tuition fees of £16 500 to cover his MBA studies. 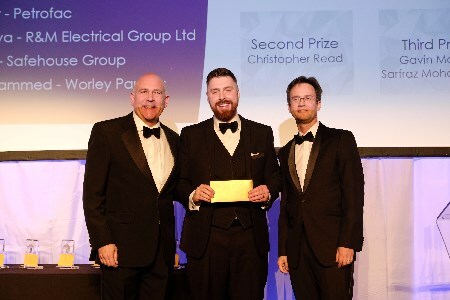 The runner up is Christopher Read from AIS Ltd who receives a £5000 scholarship towards fees and in joint third place are Gavin Moore from AIS Ltd and Sarfraz Mohammed from Worley Parsons. All three will study the course on an Online Distance Learning basis. The announcement and awards were at the EIC National Awards Dinner in London. The course is accredited by AMBA (Association of MBAs) and RGU was recently awarded a Gold rating in the 2017 Teaching Excellence Framework.